Barnabas Collins has entered an alternate universe via an empty room at Collinwood. Unfortunately, he gets locked up in a coffin almost immediately by this universe’s Will Loomis and doesn’t get to see all the interesting goings-on that the Collins counterparts are playing out–events that include the Dark Shadows‘ interpretations of Rebecca, with Angelique in the title role, and The Strange Case of Dr. Jekyll and Mr. Hyde. But this version of Rebecca has an unexpected twist. After weeks of putting up with everyone believing that she was really her dead twin sister Angelique, Alexis Stokes visited Angelique’s coffin in the family vault. This settles the question about Alexis’s identity for everyone, including me; Angelique’s body is in the coffin and looks perfectly fresh, not like a woman who’s been entombed for six months. But it turns out that there’s a reason for that and Alexis has made a bad mistake in touching her late sister’s hand when she bids her farewell. Angelique opens her eyes. She’s been waiting for just such a touch to bring her back, and gets up out of her coffin to exchange places with the horrified Alexis. A few minutes later, Angelique as Alexis returns to Collinwood, and the real Alexis is in the coffin, shortly to be cremated. Angelique is determined to solve her own murder. She will later say that the last thing she remembers is someone sticking a pin into the base of her skull and falling to the table, but she didn’t see who did it. She also wants to get her old life back, including getting her husband away from his new wife. Collinwood is a huge estate, but the more I see of it, the greater its state of disrepair becomes evident. It’s not only the number of disused outbuildings we’ve seen on the show; the main house itself is mostly empty. The west wing, where Adam once hid and where the children discovered Quentin’s bricked-up room, has been closed since the turn of the century. Lately, Barnabas has been prowling the equally abandoned east wing, although no information is given on how long that’s been shut up. The 20th-century Collins family lives in a few rooms in the central block. They aren’t poor by any standards, but when I see what the Collinses were and what they might’ve been, I start to think this is one of those decayed New England families that you run into in Lovecraft stories–not as bad as the Whatelys, but kind of like the Marshes without all the amphibian intermarriage. In his wanderings, Barnabas discovers a room that gives him glimpses of a very different Collinwood. Most of the time, the room is empty, but once in awhile he opens the doors to find it lushly decorated and occupied by alternate versions of people he knows well. Elizabeth Stoddard is no longer mistress of the house, but she and her brother Roger appear to be poor relations living there on the generosity of a wealthy cousin–one Quentin Collins. Julia Hoffman isn’t a doctor, but the housekeeper. A portrait of Angelique hangs over the mantelpiece; conversations between the people we see in the room establish that she was Quentin’s wife but died six months ago. This lush room was hers. Willie Loomis isn’t a barely literate handyman, but William Hollingshead Loomis, author of the historical biography, The Life and Death of Barnabas Collins. Miss Hoffman contemptuously flings a copy of this book out through the doorway while Barnabas is standing there watching–he can’t cross the barrier of the doorway himself and the people in the room can’t see or hear him. He reads the last pages and learns that this other version of Barnabas Collins died in 1836 after a happy and fulfilled non-vampiric life, survived by his wife Josette and a number of children and grandchildren. It’s been awhile; I’ve continued to watch Dark Shadows on DVD, but for a long time wasn’t sure whether or not I would go on writing about it since we’re now well into the part that most people who know the show at all are already familiar with. Since a whole lot has happened since I last wrote about this series and I want to catch up, I’m going to condense the story through a number of episodes. When last we looked in on Barnabas Collins, he was renovating his old home to make it look as it did when he lived in it over 100 years ago. Now that he has parts of the old house fit to receive company, he invites his family and a few chosen others over for a costume party; he will provide the costumes. Normal people might say “What fun!” or “I’m not dressing up in that silly outfit,” but the Collinses regard the upcoming party with a strange sense of foreboding, as if they’re expecting something terrible to happen. They repeatedly speak of how Vicky is too much in love with the past. As Barnabas delivers the party clothes, he also provides historical identities for each person, based on whom their clothes used to belong to. Elizabeth Collins Stoddard and her brother Roger are given clothes belonging to Barnabas’s parents Naomi and Joshua. Carolyn’s dress belonged to a cousin named Millicent, and Vicky’s once belonged to Barnabas’s beloved Josette. Burke Devlin, who has also been invited, is given a suit belonging to Josette’s husband, Jeremiah Collins. Now that Elizabeth Collins Stoddard is out of the way, Roger overrides her instructions to Vicky and Carolyn not to let David near Laura. He is, after all, the boy’s father and he isn’t as intimidated by the two girls as he is by his big sister. He lets David have a sleep-over at the cottage where Laura has been staying. While the boy sleeps in his mother’s arms on the sofa, Josette makes one of her jasmine-scented appearances; Laura sends her away, saying that there’s nothing the ghost can do while she’s holding her son. Nothing else happens. After all their predictions of disaster, Vicky and Carolyn are a little disappointed the next morning when David tells them that he had a nice time with his mom. 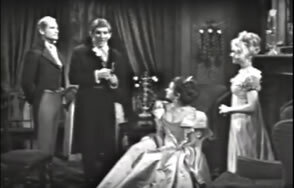 Dr. Guthrie, meanwhile, proposes a séance to contact Josette. He’s doubtful that she’ll appear, but I was sure she’d show up. She’s been in more episodes lately than Joe or Maggie. Roger sneers as usual, but agrees to it. Laura refuses to attend. The séance is performed on a dark and stormy night. Great! I love this stuff.